Hardy & Jensen was started on March 11, 1992 by two leading installers, Dennis J. Hardy and Edward L. Jensen. The company was incorporated on September 1, 1992. Dennis and Ed expanded the business with family members and other installers who shared their high standards and level of expertise. The company mission has always been to treat the customer fairly and professionally and to give them the best service available. Our products and services include Replacement Windows and Doors, Sun Rooms, Awnings, Siding, Trim, Rain Gutters, and Gutter Helmet®. Gutter Helmet is a simple, affordable solution that eliminates the need for gutter cleaning. We can install it on your existing gutters or along with brand new gutters. Many contractors offer gutter protection solutions, but Hardy & Jensen only wants to offer the best products, so we chose Gutter Helmet. With over 30 years on the market, they have a proven record of excellence and are still #1. More than just reducing maintenance, a gutter cover protects your home from the damage that can result from overflowing rainwater. When leaves and other debris block the flow of water to the downspout, the water goes over the sides and erodes the ground around your foundation, gets into your walls and roof, and can cause all kinds of moisture-related problems in your home. Let Hardy & Jensen Help! 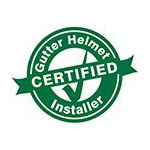 Why not let us help you protect your home and end regular maintenance tasks by installing new rain gutters and Gutter Helmet® covers on your home. The employees at Hardy & Jensen, Inc. will treat your home as if it were their own and make sure that everything runs smoothly from meeting the salesperson, signing the contract, measuring the job and installation of the product in your home. Our sales staff is very knowledgeable and always willing to answer all questions and show the customer all options. We are excited about your project as you are, so our sales staff always tries to stop at the customer’s house on the day of install. We are proud of the work we do and the many satisfied customers who have become friends and repeat customers. We want to thank all of the wonderful people that we have met, worked for, and who have helped us become a leader in the home improvement business for the different areas we cover. Find out why we have so many happy customers and contact us today. Just call (800) 824-3772 or fill out the online form here. Our Hardy & Jensen Representatives are Charles Benedict, Dennis Hardy, Dan Hardy and Andrew Hardy.